C/ Pou Roig, 70, 07840 Santa Eulalia del Rio, Spanje. The Hotel Miami Ibiza is a three star rated hotel situated in the Es Caná area, front line next to the beach of the same name. 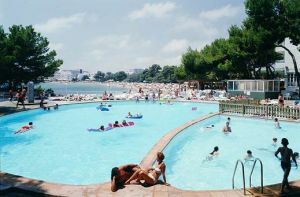 Its privileged location makes it the ideal hotel for a family holiday. 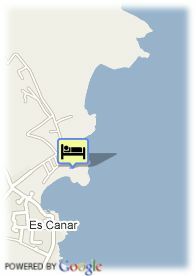 The hotel is in a quiet area, at least 500 metres from the shops, bars, restaurants and the small port of Es Caná. The hotel with its enormous circular swimming pool, terraces and the sea a few feet away offer all the necessary ingredients to spend a fantastic holiday without even having to leave the hotel.